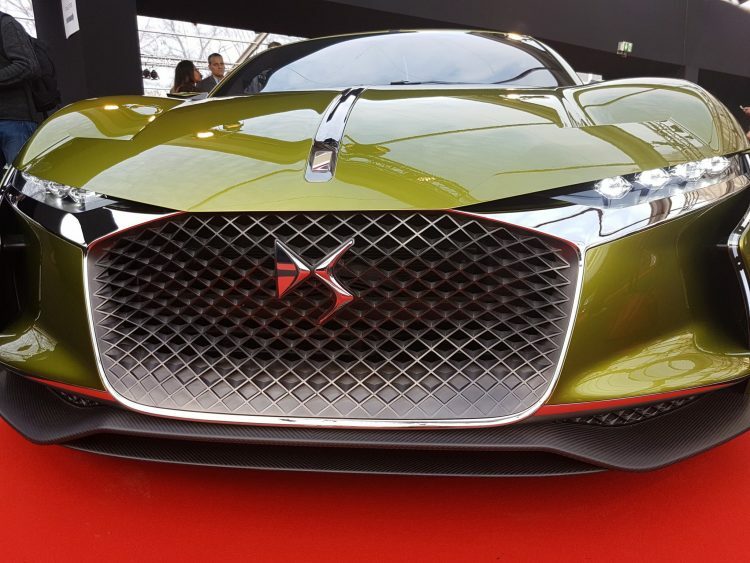 The Ds E-Tense. Photo by Akil Wingate. The Aston Martin RB001. Photo by Akil Wingate. Aston Martin is something of a freak of nature. 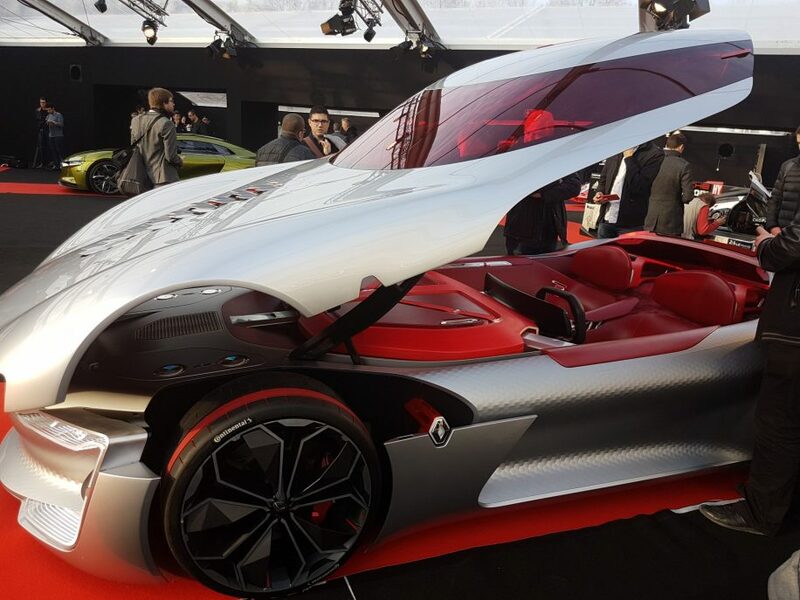 Last year at 2016’s Paris concept car event, it shared the spotlight with Mercedes Benz’s concept car. The two models looked like twins eked out of the same magical factory of untouchable concept cars. There were moments when it seemed almost impossible to denote which was which when merely taking a split second glimpse at the two silhouettes. Luckily for Aston Martin, Mercedes Benz wasn’t in attendance this year to steal its 120 mph thunder. 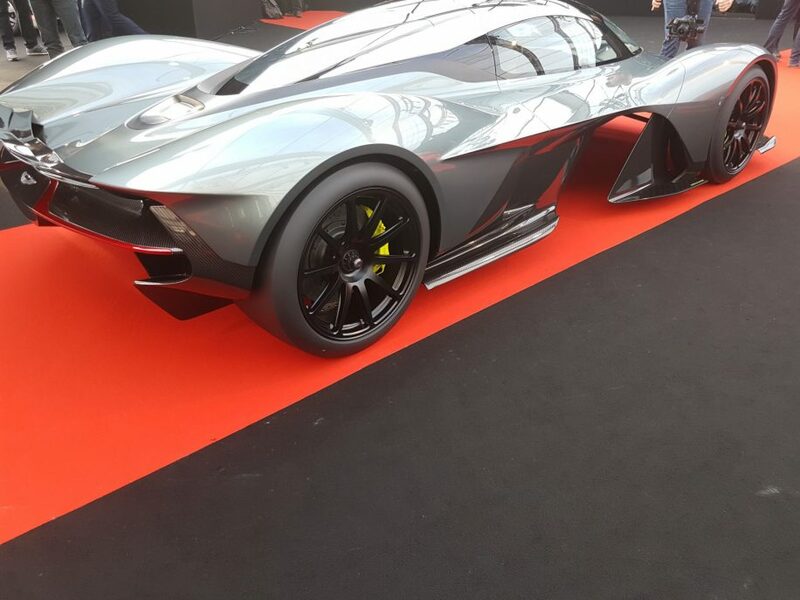 Instead Aston Martin once again cut a remarkable silhouette with its sleek silver RB001. A strong collaboration between Aston Martin and Red Bull Racing, their hypercar sports a carbon fibre chassis and a V12 engine that sits behind the passenger compartment, driving only the rear wheels. The car will price out at $3 million when its mere limited edition 100 models hit the market in 2018. According to the geniuses behind the car, it will be the fastest street legal car on the market when it debuts. Until that time, Aston Martin is pretty much mum about the remaining specs. The Renault Trezor. Photo by Akil Wingate. Renault is like a phoenix emerging valiantly and victoriously from the ashes this year. Last year saw the French automaker mired in scandal at just the wrong time, the COP21 environmental conference where it was the official automobile. Only thing is around the time of COP21 some damning evidence floated to the surface that suggested the carmaker wasn’t as clean as it purported. So for last year’s concept car show only the standard Talisman made an appearance. This year, Renault redoubles its efforts and pulls out the big guns with the TREZOR, a remarkably svelte looking vehicle that seems to follow the script that Aston Martin and Mercedes implemented last year: muscle, sleek lines, speed and charisma. The electric 2 seater coupe abandons any threat of clean energy questions by going the route of alternative fuel sources. The bonnet features a honeycomb air inlet, a design trend that has traversed the forward thinking circles in interior design tech and architecture to the automotive industry. The very same bonnet lifts and exposes the interior passenger compartment. Rather than bending over and ducking into the vehicle, passengers step directly into the car. We saw a similar idea put forward with Rolls Royce’s concept car from last year. It boasts 350 horsepower and 380 Nm of torque. And when gunning down the roadway it hits 100km/h in less than 4 seconds. The Ds E Tense. Photo by Akil Wingate. 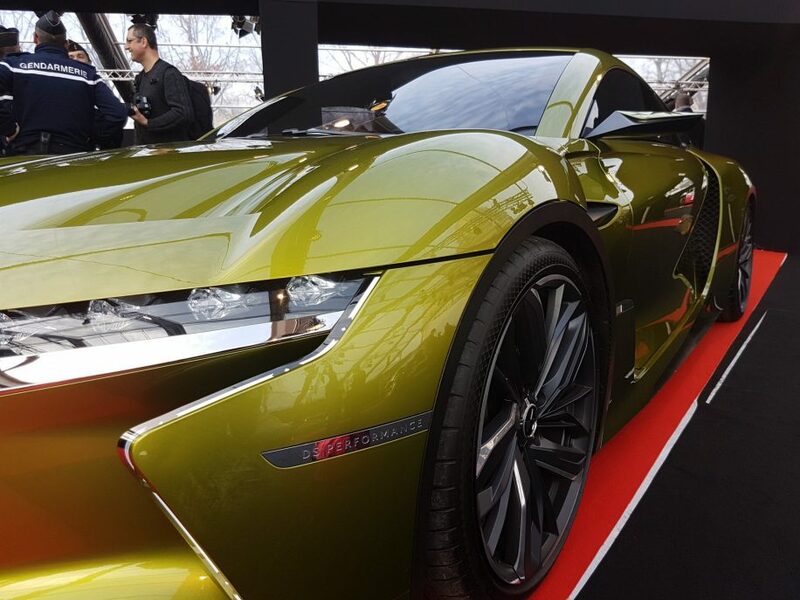 We first got a glimpse of the Ds E-Tense at the 2016 Geneva Motor Show. It rounds the bend of 2017 to give us a more in depth look at what it has pumping under the hood. It like its neighbors here on this list is fashioned out of a carbon fibre body with an electric engine pumping out 402hp. One full charge will carry the vehicle 223 urban miles. And it hits a remarkable 65mph in less than 4.5 seconds. All of that adds up to a solid recipe for a sporty electric muscle car. Is there even such a thing? The body is sleek and aerodynamic, its Festival Automobile iteration coming in a scintillating lime green coat. There is however no rear viewscreen. So for purists get used to pulling in reverse with the aid of the camera fixed peculiarly in the spot we normally reserve for a rear view mirror. The interior is chock full of other surprises including an air purification system, a 640W speaker system, a 10 inch touchscreen, LED lights and display, and a plush interior that according to the folks at DS took 800 man hours to design. The meticulous marriage between chic elegance and automotive testosterone is sublime. 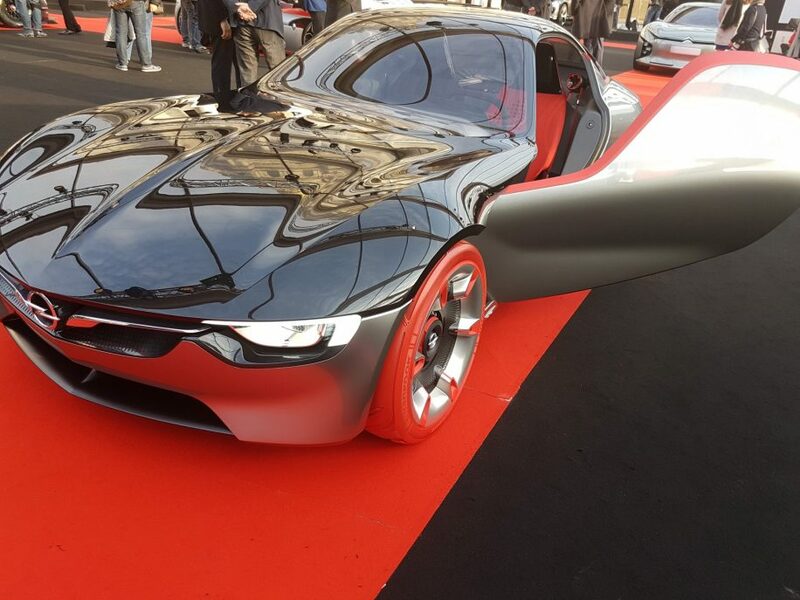 Here’s your next roadster fantasy folks. The Opel GT Concept. Photo by Akil Wingate. Opel cut perhaps the most hypnotizing silhouette with its futuristic GT Concept. A modern take on the Corvette, the 2 seater hits 60 mph in an okay 8 seconds. The sleek red line that runs across the body traces the intimidating musculature of the body. Headlights are fixed low on the front and the engine roars in the back. Its curb weight keeps it svelte and lightweight at under 2200 pounds. Given the amount of competition it’s facing with the other concept sports cars on hand, Opel played things safe and didn’t take too many risks. Aesthetically the vehicle looks the part of a true champ. The doors are curved and wave like, remaining faithful to the aerodynamic profile the GT slices through the wind with. When it comes to performance however there are a handful of other less pretty vehicles who ramp up above 60 in less time, boast more horsepower and implement some heavy and equally rewarding design choices in the offing. Still from a distance, you can’t look away. So Opel stays on our list.